As you are adding items to your home, they are organized by status. Now Showing is the one displayed at your home page (green check). Coming Soon are items that are published and have a future release date. Not Published are draft items that you have created but have not yet published. Past Items are home page items that were displayed at one time, but others were posted after them. 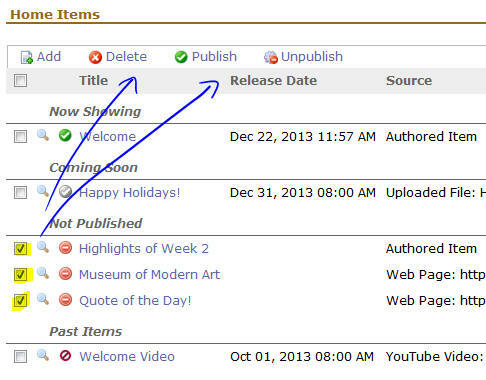 You can see the release date of an item, if set, the type of item it is (video, authored content, file or web page), and when it was last edited and by whom. To preview a home item, click on the icon to the left of its entry. To Edit an item, click on its title. You can publish, unpublish or delete home items in bulk. Just select the items and click on the desired function. Note: In order to publish an item, it must have a release date.